This small, common Kreature is most abundant in wooded areas, where it can be found hiding under debris or sucking on tree roots. 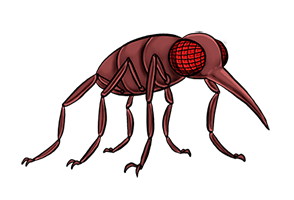 When it needs to beat a hasty retreat, it'll release the pressurized irritant gas from its abdomen to shoot off like a missile. The gas alone can propel it up to 18m and its sheer momentum will carry it even further than that, and once it shoots off it can't control its descent. Though it is largely inoffensive, vandals have been known to collect feral Sprineeds and fire them off on purpose; a misfired Sprineed can inflict terrible property damage, as its proboscis can punch through a plate of titanium 150mm thick as if it were tinfoil. It’s rather unfortunate that people with nothing better to do with their free time, fire off these little critters.